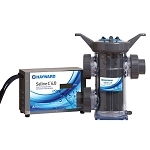 Hayward Saline C 6.0, NSF-certified salt chlorinator is designed to produce up to 6 lbs of chlorine per day. That’s enough to chlorinate larger pools up to 125,000 gallons, but at a savings of up to 60% over chemical chlorine. Its compact design is comprised of a single clear vessel and power supply, eliminating the need for daisy chaining multiple salt cells. This more-efficient design lowers installation costs and consumes less space. Combining Hayward Saline C 6.0 with Sense & Dispense chemical automation, makes it an ideal water chemistry solution.